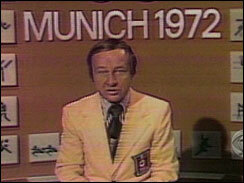 Jim McKay kept the world abreast on the tragic events of the 1972 Munich Olympics. It was 40 years ago, September 5, 1972, when sports and politics merged in a tragic manner with the killing of 11 Israeli hostages during the 1972 Summer Olympics in Munich, Germany. One of the things that made this tragedy so engaging was that it was broadcast live across the country and world through the reporting of ABC News and Sports. While today having cameras covering live-action events is standard practice, this was ground breaking real-time access in 1972 and gave viewers a far different perspective of what was happening than ever before. Anchoring the coverage for ABC was renowned sports broadcaster Jim McKay. In addition, Chris Schenkel in the studio and Howard Cosell and Peter Jennings posted on the grounds added unique perspective and insight. Now 40 years later re-watching the coverage it looks a little primitive and dated compared to modern high-definition video, but for the times it was amazing that they were able to get such close-up footage of the terrorists, police and negotiators. While there is little doubt that the negotiations and rescue mission associated with the tragedy were badly managed and plagued by confusion and ineptitude by the Germany police, the broadcast by ABC was handled with amazing professionalism and grace. The final announcement by Jim McKay that they were “all gone” was done with amazing humility, sadness and grace and stand as one of the most memorable live broadcasts in television history. It is quite sad that 40 years later the Olympic leaders refused to recognize this tragic event with a moment of silence. The tragic occurrences of Munich transcend politics and political views and should be remembered as a sad moment where innocent athletes had their dreams and lives snatched away. Acknowledging and remembering these athletes is not a political statement, but a statement about the importance of human life and the mission of the Olympics to bring together people from different nations around a common purpose. In remembrance of the 40th anniversary, here are some clips from the amazing ABC coverage as well as documentaries that look back at the tragic events.